The Røykjafossen is a tiny stream waterfall in the Aurdalen near Osa, miniciplaity Ulvik/Hordaland. The river Austdøla drops down over 20 meters but seems to be higher if you place somebody on the rocks. A large roch sticks out over the fall and is called a Troll’s nose. Perfect place for taking beautiful pictures. With the right angle (viewpoint) the Kyrfossen can be seen on the background. The Røykjafossen can be found just outside Osa, driving (to the east) into the Austdalen (Osafjellvegen). From Osa it is a 10 minute walk from a sculpture called “stream nest”. The Stream Nest sculpture is a work of art built for the winter Olympics inLillehammer. Later it moved to Osa. 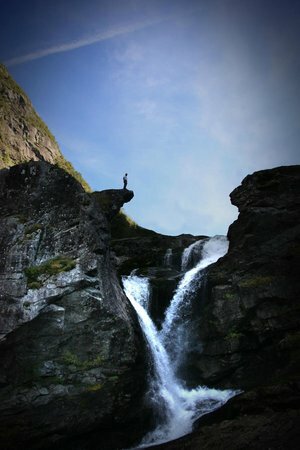 Probabaly the Røykjafossen is a regulated waterfall and can differ in capacity. Besides the Kyrfossen also the Balåifossen is nearby, one of the highest waterfalls in Europe.